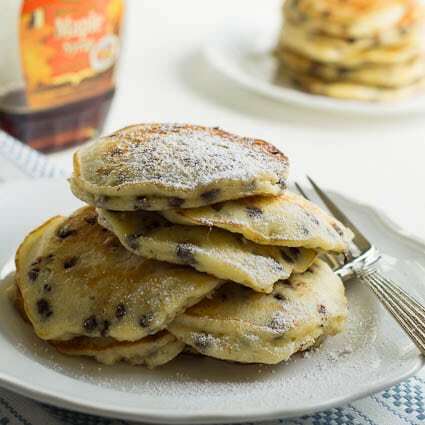 This sour cream-chocolate chip pancake recipe from Lisa Yockelson’s ChocolateChocolate Cookbook produces phenomenally rich, sweet, and decadent pancakes. To be fair, they really should be considered dessert. But since pancakes are a breakfast food, we get a pass eating them for breakfast. Thankfully it makes a large batch. Everyone will be back for seconds. I like to serve them with some nice and salty sausage patties. In a large bowl, whisk together flour, baking powder, baking soda, salt, and sugar. In a medium bowl, whisk together eggs, egg yolk, melted butter, sour cream, light cream, and vanilla extract. Pour wet ingredients over dry ingredients and add chocolate chips. Using a wooden spoon or spatula, stir together just until combines. Batter should be fairly thick. Add additional cream 1 tablespoon at a time if batter is too thick. Heat a griddle or large nonstick skillet over medium-high heat. Wipe surface with butter and pour a scant 1/4 of batter onto griddle for each pancake. Cook until bubbles appear on top and flip. Cook about 1 additional minute, or until set all the way through. 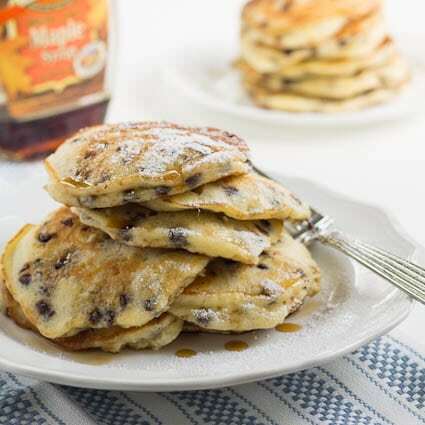 To serve, dust with confectioners’ sugar and serve with maple syrup. Spicy Southern Kitchen is an amazon.com affiliate. This entry was posted in Breakfast and tagged Breakfast, chocolate, pancakes. Bookmark the permalink. 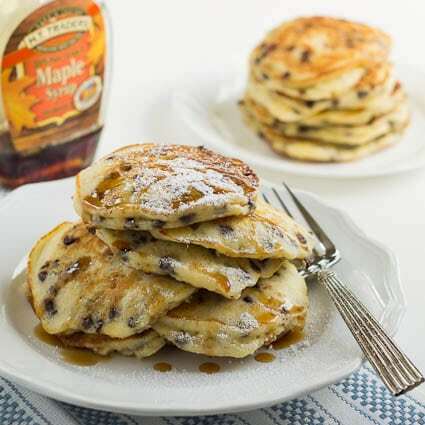 I’ve been having dreams about chocolate chip pancakes lately. I’ve been planning to make them, but then realized I still have a whole plate of chocolate chip cookies sitting on the counter. Now, you’re making me crave them again! Yum! Wish I had a few of those choclate chip cookies! My son would LOVE these…Of course, anything with chocolate in it can’t be bad, right? aw, what cute little pancakes! 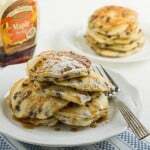 Why didn’t I think of adding chocolate chips into my pancakes?! Yummy idea! OMG Christin, these look so soft and delicious! Best dessert for breakfast idea ever! I bet that sour cream makes the texture absolutely perfect. Sour cream does wonders for everything!